Are telepresence robots really robots? Are telepresence robots really robotic? Is the da Vinci robotic surgical system robotic? Is a car with adaptive cruise control acting robotically? Well … no to all three questions. These and many other topics will be discussed next week at Innorobo, in Lyon France along with an extensive exhibition of service robotics start-up companies. A few months ago Suitable Technologies brought 50 Beam “robots” to the RoboBusiness show in Santa Clara, CA. 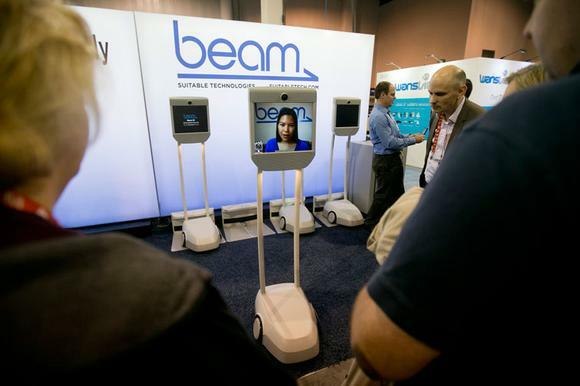 People unable to attend the conference were able to use their laptops at their home or office to link into the Beam bots and “drive” them around the show, all the while being able to talk and see and communicate with people along the way. Tuesday I’ll be in Stuttgart, Germany but will use a Beam bot located in Lyon, France to participate in a roundtable discussion on funding, financing and collaborative work. It should be fun. PS: l will physically be in Lyon at Innorobo Wednesday and Thursday.